UPDATED July 25, 2015. It has been a few days since the news broke out about the expulsion of Cristina Villanueva Manalo, widow of the late Ka Erdy Manalo of the influential Iglesia ni Cristo, and three of her children from their church. This is but another episode in the complex Ysagun-Manalo family that started with the birth of the INC's founder, Felix Manalo Ysagun, whose history is discussed below. What this blog post (and later 2 more) is all about is a discussion on the genealogies of three religious figures in Philippine history: Gregorio Aglipay, Felix Manalo, and Apollo Quiboloy, the founders of the Aglipayan or the Philippine Independent Church, the Iglesia ni Cristo, and the Kingdom of Jesus Christ, The Name Above Every Name, Inc. For today, we will begin with the genealogy of Felix Y. Manalo. In August of last year I met up with a fellow genealogist and a friend, Felvir Ordinario, when I was at the Family History Center of the LDS Temple in White Plains to continue my research on several prominent Filipinos. When we had the time, we discussed and wondered why the above-mentioned three founders of Filipino Christian churches have never had their genealogies explored before. Later I discovered an article by Joseph J. Kavanagh online which discussed, albeit not comprehensively, the early life and family of Felix Manalo. Another online article from Philippine Studies by Pedro S. De Achutegui and Miguel A. Bernad also gave a brief discussion on Gregorio Aglipay’s family. Although my goal today in writing this was to do the genealogies of the three in one article, seeing as there were only two full studies done on Manalo and Aglipay so far, and none for Quiboloy, this article would just be the first in a series of articles on these religious leaders. A post by my friend Felvir explored the immediate family of Felix Y. Manalo, His article made superb use of archival documents to shed light on Manalo's parents and grandparents. In the end, because of several years' worth of lacking documents from the Taguig collection, he was only able to definitively establish the names of Felix's maternal grandparents though he was able to make some excellent deductions with regard to the father of Felix Manalo. Here is where another interesting thing comes to our notice. Manuel Manalo was described as a moreno in his son Andres's baptismal record. However, Manuel's father, Evaristo, is described as a criollo, a term to describe Spaniards born in the Philippines. What is clear with what little information we have on the genealogy of Felix Y. Manalo is that both his paternal and maternal sides have been living in Taguig since at least 1782. Another clear conclusion we can come up with is that the earliest Manalo and Ysagun generations were of Hispanic descent. Of 17 identified as morenos, mestizos, and criollos, 15 were Manalos while only 2 were Ysaguns. The two Ysagun men, Antonino and Ygnacio Ysagun, were both described morenos. The 15 Manalo men can be divided into 4 criollos, 1 mestizo, and 10 morenos. Interestingly, these racial classifications only appeared from 1782 to 1838 records. After that everyone was either mestizo or indio. Another interesting aspect of the family of Felix Y. Manalo was the fact that though his parents were consistently described as poor, many of his maternal relatives were local functionaries. 10 of the Manalo men were listed as cabezas de barangay while 4 Manalo women were wives of other cabezas. One of these was Bonifacia Manalo, who remarried to Don Clemente Mozo. Finally, one last observation on the Manalo/Ysagun family tree. Before the 1885 marriage of Mariano Ysagun and Bonifacia Manalo, there were at least 2 earlier unions between these 2 families. In the 1790s we see the baptismal record of Maria Manalo, daughter of Policarpio Manalo and Agustina Ysagun. In 1829 Salvador Ysagun (incidentally the grandfather of Felix Manalo), married his first wife, Dolores Manalo. Quennie Ann J. Palafox. 122nd Birth Anniversary of Ka Felix Manalo, April 3, 2013. 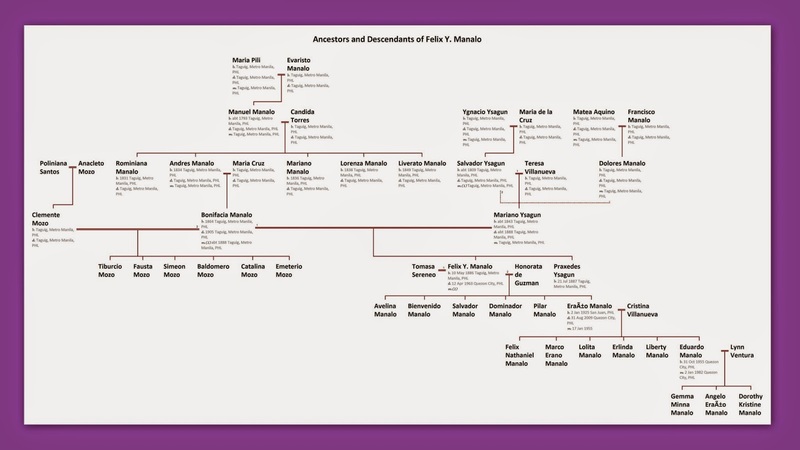 Felvir Ordinario, Tracing the Ancestry of Felix Manalo, August 2014. Joseph J. Kavanagh. "The "Iglesia ni Kristo"", Philippine Studies vol. 3, no. 1. Manila: Ateneo de Manila Press, 1955. 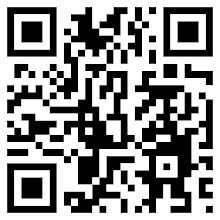 FamilySearch, Registros parroquiales, Catholic Church. Saint Anne (Taguig), Bautismos 1683-1830. FamilySearch, Registros parroquiales, Catholic Church. Saint Anne (Taguig), Bautismos 1830-1855. FamilySearch, Registros parroquiales, Catholic Church. Saint Anne (Taguig), Matrimonios 1825-1856. FamilySearch, Taguig (Rizal). Record Management and Archives Office, Vecindarios 1878-1892.